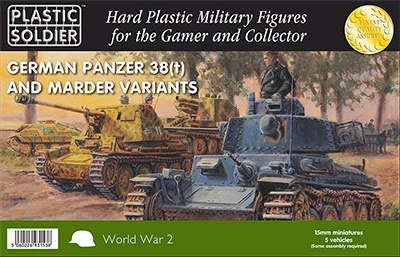 The new Plastic Soldier Company's Panzer 38(t)/Marder III variants was pencilled for a release long before Christmas, but there was a problem with the moulds and apparently the kits didn't go together very well, so there was a bit of a delay in them being released properly until recently. This is one of the good points about PSC, their customer service is second to none and we were kept informed about all the delays and problems they were unfortunately having in getting this kit on the market. I had pre-ordered a set and had waited patiently ever since, however, the wait was well worth it as my order arrived in the morning post yesterday. The kit comes in one of the larger sized PSC boxes, like the Tiger Tank, because there is so much choice in there! There are options to build the Panzer 38 (t), a Marder Sdkfz 139 or a Marder Sdkfz 138H. For my ongoing Stalingrad project I wanted two of the Marders to be the Sdkfz 139 variant (I know the Marders used at Stalingrad were Marder IIs, but I cannot find any for sale in 15mm anywhere, so these will have to stand in for them!). The other three vehicles will be the Sdkfz 138H variant for my late war forces, as I already have five Panzer 38 (t)s from Zvezda. Update: I have discovered since writing the previous sentences that In was thinking of the Marder II Sdkfz 132, which isn't available in 15mm, however, the Marder II Sdkfz 131 IS available in 15mm and I actually have three of these vehicles already! So I may paint all of these as 138s... With this in mind, I built one of the 138s as a test and here is a quick review of it. First of all, with all PSC products, the moulding is clean, the plastic is of good quality and the small detail really shows. In this kit, I noticed that the tracks had the minimum of detail on them, unlike some other PSC tanks, this is because the tracks and wheels are moulded as a single piece to aid construction. It's not a major problem for me, as I'd rather have a quick build than have to fiddle about with a track in several pieces. It took less than an hour to build, everything fitted exactly where it should and the instructions provided were clear enough to follow. The kit needs minimum construction experience to complete and was a very enjoyable build. One thing I didn't do and should have, was to spray the sprues with an undercoat. There are parts of the model that will be difficult to reach with a brush, like the interior of the hull, which can be seen! My mistake! The kit comes with quite a few crew men, but I wasn't so keen on them, one chap has an extraordinarily long arm and some of the others are a bit chunky for my liking. I have some Command Decision SP Gun crew that I will probably use or at least mix in with the PSC crew. But there is some great stowage for the vehicles, including some ammo boxes, jerry cans and a wrapped up towing cable! You'll notice I've not added any of that to this kit yet, but don't worry, it will be! I'll finish this off in the late war three tone camo scheme, but that will be later in the week. There is a lot of unused material in the box, but I am going to use the spare gun barrels and Panzer 38(t) turrets for some concrete fixed defence positions, so the wastage will be minimum. All in all, the set was well worth waiting for, it has far more positive points than negative points (which centre around the crew men, rather than anything else) and they will be a welcome addition to my Stalingrad and Late war forces! Thanks Paul, yeah I had some real nightmares with the early PSC kits, especially the T34, I am happy at this scale to lose a bit of detail over quick building. If I want detailed models I'll go for 1/35th scales! Good review - they are next up on my 'gotta have' list! Cheers Troy, I'm glad it has been of some use. They are definitely worth a punt! Nice model, shame I'd already cracked and bought some BF ones. The one piece tracks are huge improvement, they are way better than the Zvezda one piece ones. These are the first one piece tracks I have had with PSC and they were a joy to put together.